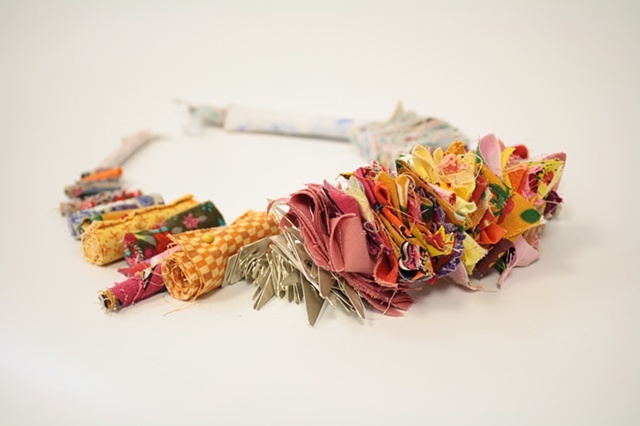 Kristi Rae Wilson deconstructs and reshapes fabric remnants to address domestic attachment in familial roles, legacies, and everyday stories. Wilsons work seeks to understand the traditions, memories, and associations of the various communities she exists within. She received her MFA in Jewelry/Metals from the University of Illinois in Urbana-Champaign. Her work has been included in international and national publications and exhibited throughout the United States. The Society of North American Goldsmiths (SNAG) awarded her the Educational Endowment Scholarship to participate in the Jewelry Opere Workshop (Netherlands) where she studied with contemporary jeweler, Ruudt Peters. Wilson, was an Artist-In-Resident at the Houston Center for Contemporary Craft (2010-2011), a guest lecturer at Bowling Green State University (2012) and New Mexico State University (2014). Recently, she served as the Gallery Assistant Manager for the Ingham Chapman Gallery (2015-2016). Wilson currently teaches Small Metals Construction, Intro to Art History and Drawing at the University of New Mexico-Gallup.